Topic relationships including related topics & semantic information like synonyms. Topical influencers (~2.5M) with score and rank. Topical content and information in the form of articles, videos and conversations. Additionally, Right Relevance provides an Insights offering that combines the above Topics and Influencers information with real time conversations to provide actionable intelligence with visualizations to enable decision making. The Insights service is applicable to events like elections, emerging technologies, issues/activism, conferences, product launches etc. This report is a summary of graph analysis of engagements and conversations including retweets, mentions and replies of tweets related to the subject of ‘Industrial IoT’. The report leverages tweets sampled from March 1st to March 31st 2017 and along with Right Relevance topics, topical communities’ and articles data form the basis for the analysis. The phrase used for gathering tweets is “iiot”. Tableau Online Dashboard: Visualizes graph analysis results via charts and tables. Insights include flocks, top trending terms, top hashtags, top Users/accounts, RR topics, top tweets and several other measures. Faceting is supported per flock, RR topic and Twitter/RR account. Gephi Communities Graph Visual: Extracts are shown below. For access to Tableau and the complete graphs please send email to biz@rightrelevance.com. Community detection graph algorithms like Walktrap and InfoMap are used to identify communities (as sub-graphs) in our engagements graph built using Neo4j & R. Graph visualizations are done via Gephi. The all engagements graph (Fig 1), which includes mentions, is fairly dispersed with several small communities around large industry players like GE, IBM, Cisco, Intel, Bosch, Schneider Electric etc. along with a couple of dense engagement areas invoving analysts, thought leaders, IoT/IIoT publishers, news curators etc. One high engagements area (in Purple) leading to a community around accounts that are mostly industry analysts, thought leaders (organic or via personal branding), publishers, news curators etc. Bill McCabe (@IoTRecruiting), IoT ONE (@IotoneHQ), ipfconline (@ipfconline1), CB Insights (@CBinsights), Evan Kirstel (@evankirstel), Mike Quindazzi (@MikeQuindazzi) form part of that community. Reasonably well engaged community (in Blue) centred around @ThingsEXPO (@ThingsExpo) and CloudEXPO (@CloudExpo) conferences. Several smaller communities around large industry players in IoT & IIoT like GE, IBM etc. Two of the most engaged and interesting accounts are Bill McCabe (@IoTRecruiting) and Marc R Gagne MAPP (@OttLegalRebels). 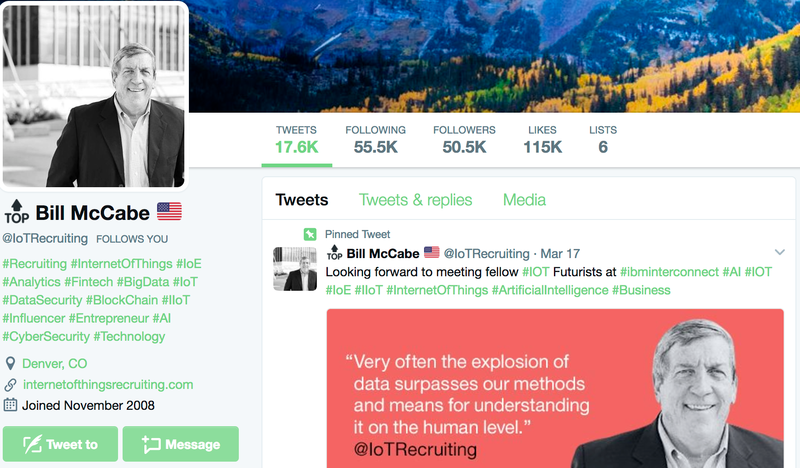 @IoTRecruiting looks like a successful personal branding effort in the IoT/IIoT space specifically applied to recruiting. This account forms the heart of the most engaged community in the graph and has the highest influence score by several measures including PageRank. The account posts/shares/RTs some of the most relevant content with high engagements and has built real influence with high Right Relevance influence scores. On the other hand, @OttLegalRebels, shows high engagements too but with bot-like characteristics and has been self organized to the outside of the graph. Almost all 1st degree engagements are due to a single tweet below (Fig 4) focused on privacy considerations in smart cities. Large number of posts are RTs at a high scale with little real influence value. Bot-like scale behavior mixed with some valuable content has helped the account build reasonable mindshare in IIoT. Latent Dirichlet allocation (LDA) based text analysis of the tweets is used for identifying high value trending terms. These along with hashtags and Right Relevance topics form the basis for identifying top conversation themes during the analysis timeframe. 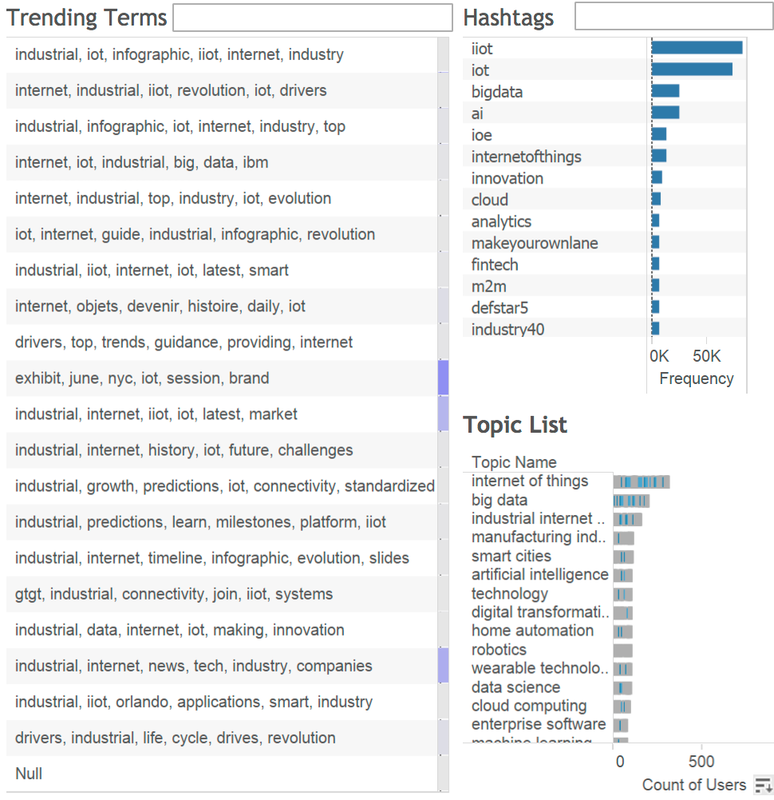 The top trending terms, hashtags and RR topics list brings out the following as top themes around IIoT (and broader IoT space). Trending terms like “revolution”, “evolution”, “future”, “challenges” along with top hashtags like #innovation, #makeyourownlane, #defstar5 capture the buzz around IIoT/IoT as one of the “next big thing”. Bigdata, cloud and analytics since these technologies are keys to leverage the exponetially growing quantities of data being generated by IIoT/IoT devices. AI, AR and ML. IIoT/IoT is part of the broader buzz around AI/AR/ML. Manufacturing industry (#m2m, #manufacturing, RR topic ‘manufacturing industry’). Using RR topics facet in Tableau is a great way to pinpoint the top accounts connected to a given conversation theme linked with IIoT. The top accounts for ‘artificial intelligence’, ‘manufacturing industry’ and ‘smart cities’ related to IIoT are outlined below. 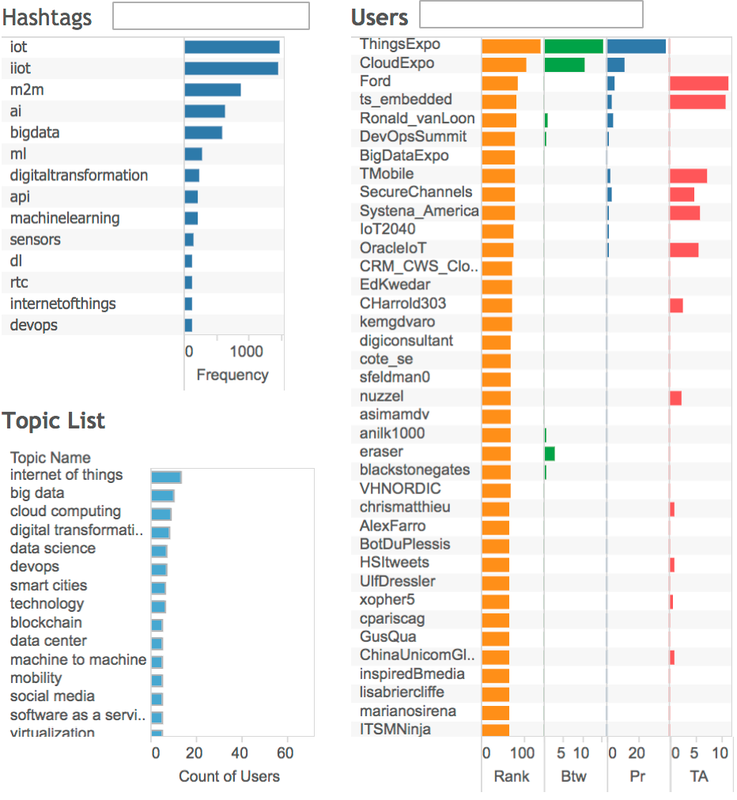 The top ‘AI – IIoT’ conversation related accounts are Bill McCabe (@IoTRecruiting), IIConsortium (@IIConsortium), TechNative (@TechNative), Kirk Borne (@KirkDBorne) and Prashant | AI (@Prashant_1722) among others. 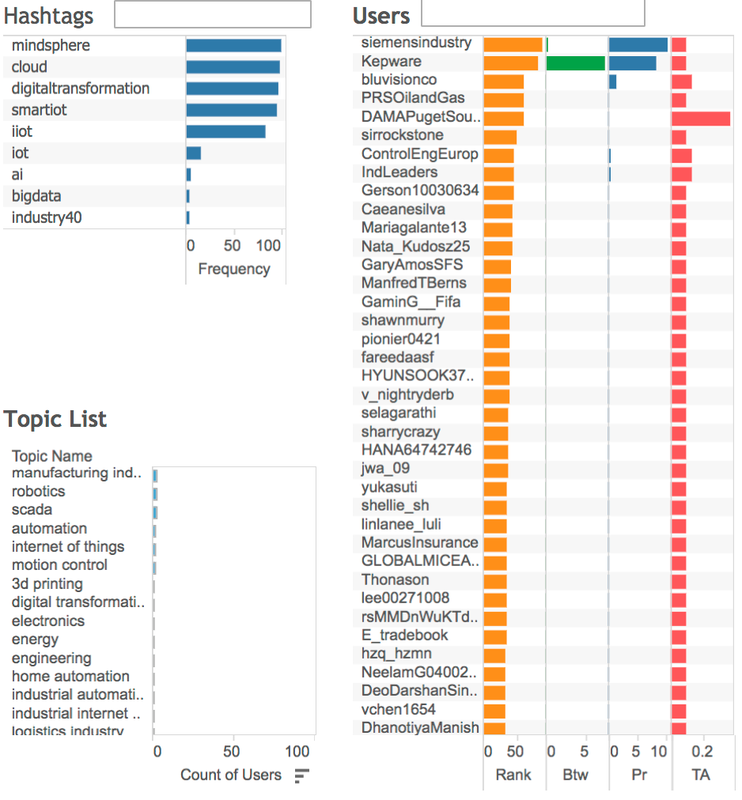 The top ‘Manufacturing Industry – IIoT‘ conversation related accounts are IIConsortium (@IIConsortium), GE Digital (@GE_Digital), Wind River (@WindRiver), PTC (@PTC), Ford Motor Company (@Ford), Siemens Industry (@siemensindustry), KUKA Robotics (@KUKA_RoboticsEN), Honeywell Process (@HWusers) among others. 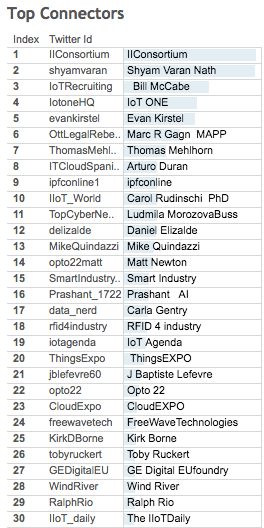 The top ‘Smart Cities – IIoT‘ conversation related accounts are ThingsExpo (@ThingsExpo), IIConsortium (@IIConsortium), Scott Amyx (@AmyxIoT), Duane Baker (@DBaker007) and IBM Watson IoT (@IBMIoT). More themes will be explored as part of the flock analysis later in the report. Measuring influence is not deterministic. It’s a subjective task with numerous different methodologies and is generally relatively dynamic and ephemeral in nature. Right Relevance platform measures users/accounts influence in 2 distinct ways: topical & engagement-based. Right Relevance algorithmically mines web content and social media at scale to determine topics and influencers and produce a measure of influence per topic termed as ‘topical influence’. Unstructured text, network connections, social signals along with semantic data, ML, NLP are leveraged to produce two sets of information; a set of ‘structured topics’ (~50K) with semantic information and; a connected graph of scored ranked influencers for each of these structured topics we call ‘topical influencers’ or Tribes. Industrial IoT (IIoT) is a structured topic in the Right Relevance platform with the following metadata (Fig 9) returned by the RR Topics Metadata API of the RR API offering. Fig 9 shows the related topics; ‘internet of things’, ‘home automation’, ‘wearable technology’, ‘big data’, ‘smart cities’, ‘robotics’ among others. 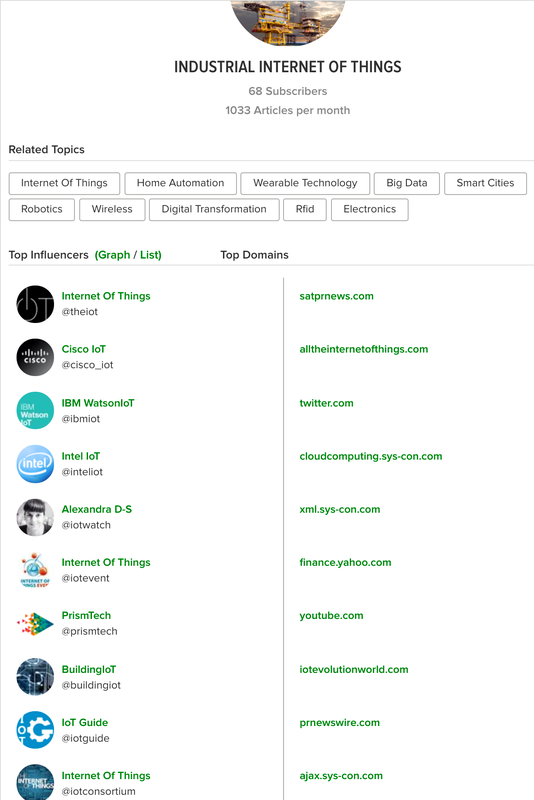 It also provides a list of the top 10 Right Relevance IIoT influencers along with the top 10 domains where influencers post about IIoT. Right Relevance ‘engagement influence’ measures are calculated by a set of graph analysis algorithms that measure the quality and quantity of engagements (RTs, mentions, replies), reach of tweets etc. within the context of a subject (event, trend etc.). We apply several methods including PageRank and Betweeness centrality to measure Flock influence. The meaning of rankings within this methodology are documented at Twitter Conversation Performance Measures. The first two lists (Fig 10) are of the top 30 accounts by PageRank & Overall measures. Overall rank is a normalized rank to reduce the skew towards users with large numbers of followers or a single tweet having a large number of engagements/RTs (often referred to as becoming ‘viral’). 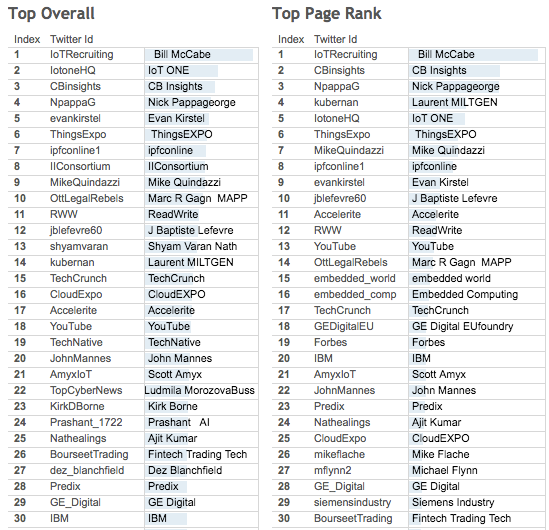 PageRank brings up Bill McCabe (@IoTRecruiting), CB Insights (@CBinsights), Nick Pappageorge (@NpappaG), Laurent Miltgen (@kubernan), IoT ONE (@IotoneHQ), ThingsExpo(@ThingsExpo), Mike Quindazzi (@MikeQuindazzi), ipfconline (@ipfconline1), Evan Kirstel (@evankirstel) and J-Baptiste Lefevre (@jblefevre60) as the top 10. 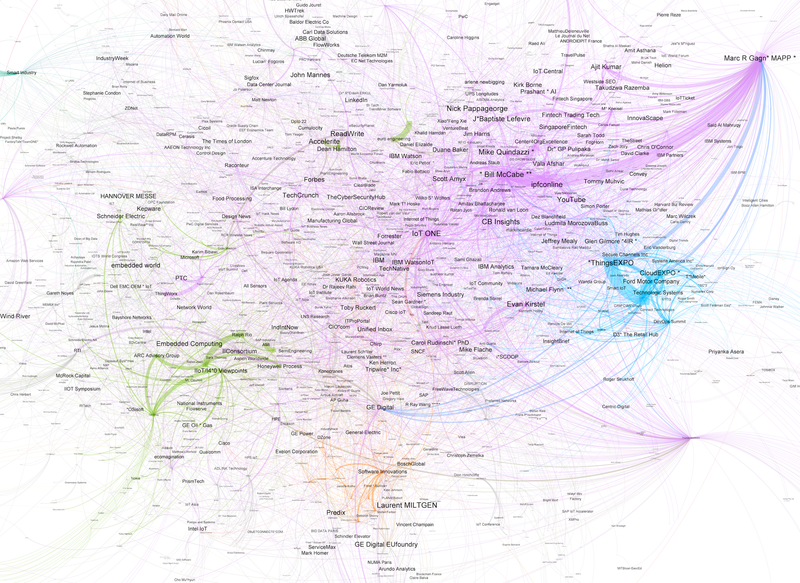 A majority of these accounts are part of the most highly engaged community visualized in the graph (Purple). PageRank doesn’t seem to provide much value here. The top Overall measure, in spite of the normalized nature, doesn’t bring up many new accounts to the top. IIConsortium (@IIConsortium) and Shyam Varan Nath (@shyamvaran) are 2 accounts that have been moved up appreciably. They are interlinked since @shyamvaran is a GE employee and part of the @IIConsortium working group. The results above lead to other measures becoming important to measure influence as discussed below. The ‘Top Connectors’ list is based on Betweenness centrality, which is a measure of the degree to which a node forms a bridge or critical link between all other users. We use this as a measure of influence wrt value in being information and/or communication hubs. 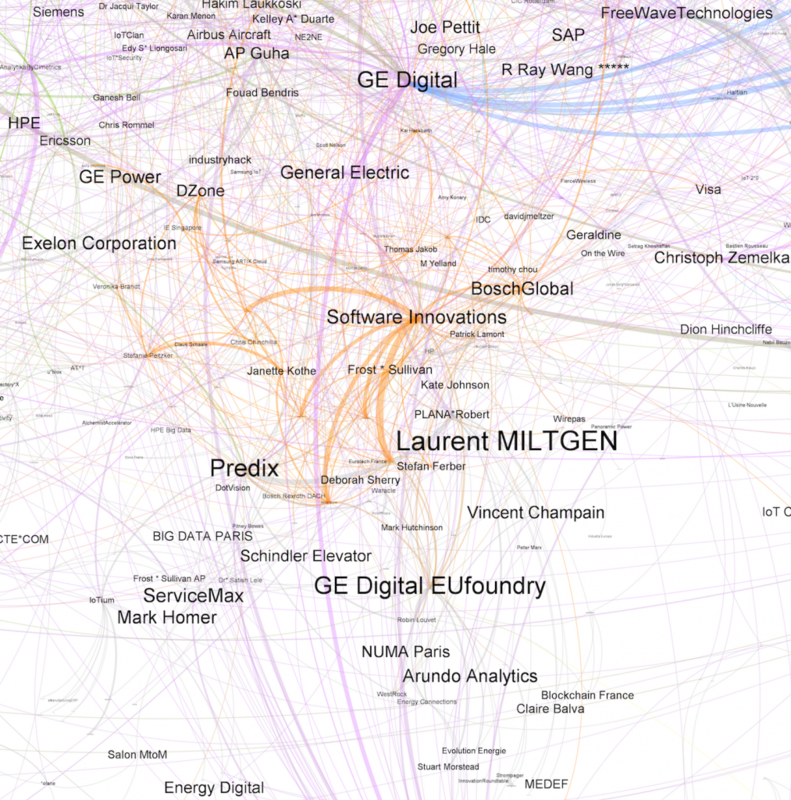 The top 2 accounts are interlinked since @shyamvaran is a GE employee and part of the @IIConsortium working group. Others like Bill McCabe (@IoTRecruiting), IoT ONE (@IotoneHQ), Evan Kirstel (@evankirstel), ipfconline (@ipfconline1) and Mike Quindazzi (@MikeQuindazzi) have been surfaced as high influence accounts by the Gephi graph and other measures above. @OttLegalRebels, identified for bot-like behavior earlier, is prominent here as it has built up influence and value as a news and information hub. Some other accounts like Thomas Mehlhorn (@ThomasMehlhorn), Arturo Duran (@ITCloudSpanish), Carol Rudinschi (@IIoT_World), Ludmila MorozovaBuss (@TopCyberNews), Daniel Elizalde (@delizalde) and Matt Newton (@opto22matt) are brought to the fore too. The value of this measure lies in that it bubbles up accounts with potentially real influence in terms of news and information dissemination on this subject. The engagements or “flocking” in the context of a subject (topic, event etc.) can lead to building of temporal communities with local influence that is not obvious by the standalone influence of the individuals or without the context of the event. The subgraphs aka communities formed by applying community detection graph algorithms are termed as ‘Flocks’. As seen in the all engagements graph, there is 1 large engaged community with several smaller scattered communities usually around large companies like GE, IBM etc. The largest sub-graph/community is composed of several sub-communties that form smaller flocks. 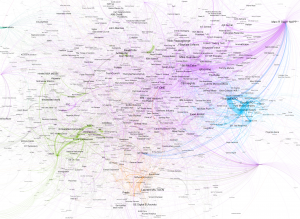 The top flocks in Tableau ‘ipfconline1’, ‘MikeQuindazzi’, ‘IIoT_World’, IoTRecruiting’, ‘IotoneHQ’, ‘OttLegalRebels’, ‘Nathealings’ are part of the same larger engaged community. Focus will be to discover other smaller flocks with reasonable engagements. ThingsExpo, along with CloudExpo, forms a clear community and 2 distinct but related flocks. @ThingsExpo and Cloud Expo are conferences to be held in June (NYC) and October (Santa Clara). IoT and IIoT is the main theme for @ThingsExpo. Top trending terms, hashtags and RR topics (Fig 12) confirm the intent and focus on the flock. 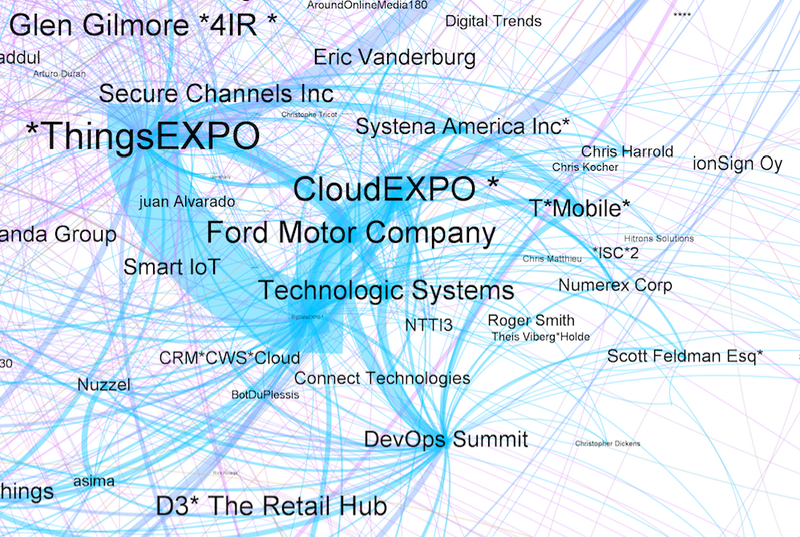 The Gephi graph snapshot (Fig 13) along with top users from Tableau show Ford Motor Company (@Ford), Technologic Systems (@ts_embedded), Ronald van Loon (@Ronald_vanLoon) among others closely engaged as part of ThingsExpo/CloudExpo flocks. 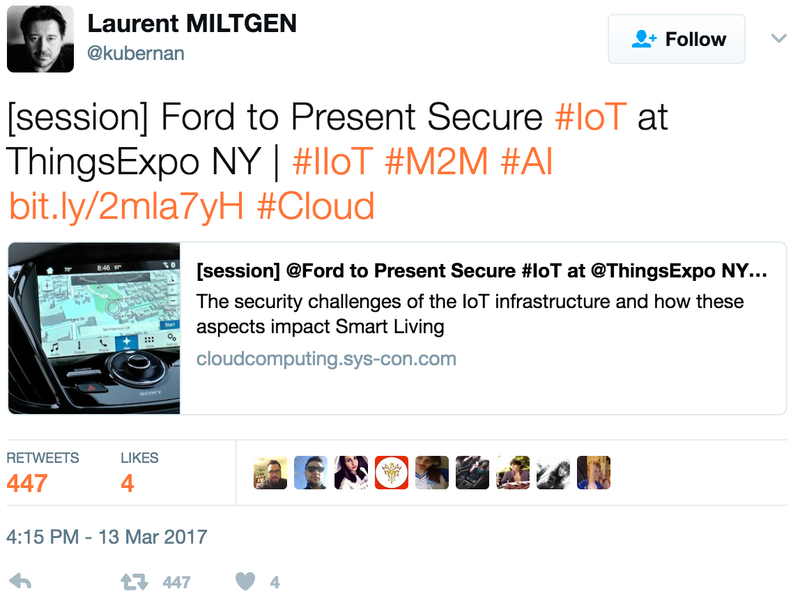 The following tweet and it’s several variations by top IIoT accounts helps understand @Ford‘s connection to the ThingsExpo flock. 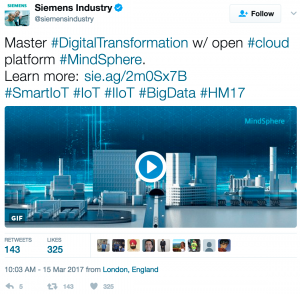 Siemens Industry flock and conversations seem focused on the ‘mindsphere‘ platform as seen by the top hashtag ‘#mindsphere’. The top tweet (Fig 16) for this flock along with several other high engagement tweets are all focused on ‘mindsphere’. Looking at Tableau, these flocks seem to be focused around GE Predix (@Predix) and it’s applications in IIoT areas related to manufacturing, analytics and digital transformation. Fig 17 shows the accounts that comprise these 3 flocks form a common community. These include Predix (@Predix), GE Digital (@GE_Digital), GE Digital EUfoundry (@GEDigitalEU), GE Power (@GE_Power), , Shyam Varan Nath (@shyamvaran), Deborah Sherry (@deborahsherry), Wind River (@WindRiver), Software Innovations (@BoschSI), Janette Kothe (@janettekothe), Kai Hackbarth (@kai_at_ProSyst), Arundo Analytics (@arundoanalytics), Will Healy III (@WillAutomate). Note: There are several more flocks that are outside the scope of this report. Please contact biz@rightrelevance.com for details. Lots of buzz and potentially big bets on real and aspirational IIoT applications including AI, smart cities, home automation, digital transformation etc. Several large industry players seem to be betting on IIoT and the broader IoT space. No clear mindshare is obvious with several pockets of influence. Big cloud software players like AMZN and MSFT don’t seem to have a measureable impact in IIoT. No cohesive large scale organization or strategy is discernable esp. for IIoT. Several early but seemingly scattered attempt. No collective industry action seems to be obvious or influential either.